Fusing in their metallic faÃ§ade, artistic embellis hments and futuristic movements, classic watches are a perfect blend of past, present and future, making them timeless in their appeal. Here's an ode to some contemporary renditions of cult classics and some new beauties, all set to stand the test of time. The subtly elegant stainless steel Ladymatic has a white ceramic ring between an outer decorative wave and the inner case body. Its bezel is paved with 184 full cut snowset diamonds with a combined weight of 1.04 carat. The face of the watch is highlighted by the supernova pattern emanating from the centre of the mother of pearl dial. There is a diamond-polished date window at the 3 o'clock and the other eleven hours are marked by single-cut diamonds with a total weight of 0.12 carat. While the hands are crafted from 18 carat white gold, the crown is distinguished with a briolette-cut diamond. The Carrera Heritage collection reinterprets the most iconic timepiece of motor racing through the prism of 150 years of horological tradition. 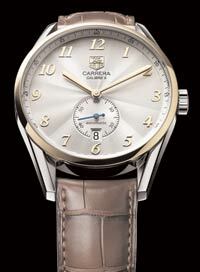 The Carrera Calibre 6 Heritage is a pared down, streamlined watch that meets the standards of today's watch aficionado. The 39mm watch edition is equipped with an automatic Calibre 6 movement with an azurage embossed small second counter and the date at 6 o'clock. The visual appeal of its 18 carat gold case is enhanced by gold numbers and hands, which look striking against the silver dial. Water resistant to 100m, this classic craft is finished with a hand-stitched chocolate brown alligator strap. The Overseas Perpetual Calendar Chronograph is exclusively for the Vacheron Constantin boutiques and comes in a steel case with a titanium bezel. 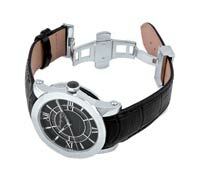 It has a generous 42mm case that is set on a black vulcanised rubber strap. It is water-resistant upto 150m. The steel case incorporates a soft iron cage protecting the mechanical movement from magnetic fields. The screw-down caseback features a medallion engraved with the famous Amerigo Vespucci three-masted sailing ship. The first mechanical movement manufactured by Montblanc takes inspiration from Nicolas Rieussec's 1821 invention of the world's first chronograph. 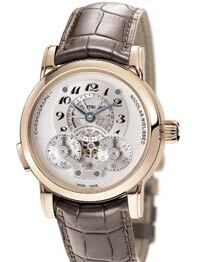 It has a hand-wound Montblanc calibre MB R100, featuring a classic column-wheel mechanism and a vertical disc clutch, which ensures friction-free power transmission to the wheels of the chronograph. Below the hour- and minute-hand turns a finely skeletonised date-disk. At 6 o'clock, the dial is has a unique V-shaped bridge that holds the ruby counter bearings for the two chronograph disks. 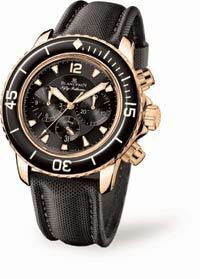 In 1953, Blancpain crafted the first 'fifty fathoms' which the Frogmen of the French Navy used while diving. 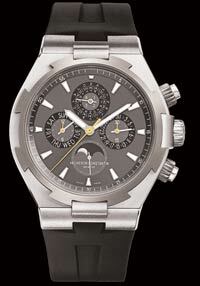 It was hailed as the world's first modern chronograph. 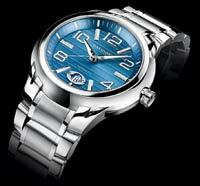 Its contemporary avatar does considerable justice to its nautical legacy with water resistance of up to 300m. Juxtaposed on the pristine black dial and bezel of this diver's watch are trapeze shaped luminescent hour markers which enhance readability underwater. It has a power reserve of 40 hours and comes in a sail-canvas strap. This watch has a white gold case, a bracelet made of high-tech ceramic with pyramid shaped links and a gold unfolding clasp. 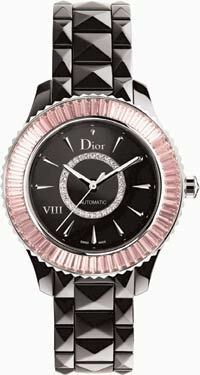 Pink being one of Dior's favourite colours, the bezel is set with pink sapphires baguettes. The black lacquered dial has hand-crafted diamond shaped indexes with the central ring set with diamonds. The crown is set with a black ceramic insert. The watch mirrors Dior's glorious couture legacy. Rado's latest is the True Jubile store special is crafted in fresh high-tech ceramic. Its white frame forms 12 sparkling dials on a clean white dial. 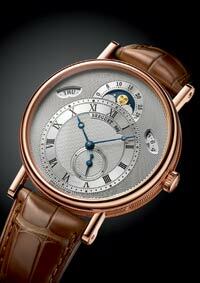 Each timepiece has been individually engraved with its own number on the reverse of the case. Sensually pristine, its round form reaffirms the principle of element integration, embodying a clear profile with beautiful diamond accents. In keeping with the nautical penchant of Zino Davidoff, the Valero Collection comprises touchstones in maritime horology. Launched at this year Baselworld, the men's watches come with a round dial embellished with classic indices and a striking horizontal pattern. These come in a choice of alligator leather or steel bracelets. A perfect extension of this line is the rugged sports version which is set in a sturdy rubber strap. Inspired by the Breguet Museum's number 3833 antique watch, the Classique 7337's dial shows the date and day of the week on either side of the indication of the age and phases of the moon, situated just above the off-centered hour chapter. This iconic design comes in a 39mm case with sapphire caseback fashioned in a choice of white and yellow gold and equipped with now famous extra-thin Breguet calibre 502 fitted with an auxiliary plate. 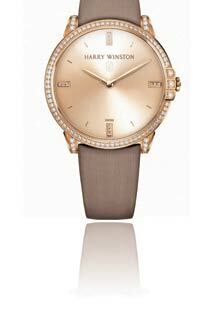 Launched at this year's Baselworld, the collection comprises bejeweled women's and industrial men's watches. The feminine Midnight Large and Midnight Midsize feature a rose champagne coloured dial that shimmers with four slender hour markers set in brilliant-cut diamonds. 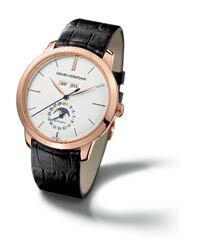 The masculine variations include the Midnight Automatic and Midnight Big Date. While the former's classic baton shape is played out by delicately beveled traditional hour markers, the latter touts a sunburst satin-brushed hour circle rimmed by a gold ring. Set in a 40mm polished round red gold case, this watch houses the full calendar complication which displays the day, date, month and phases of the moon. Enhancing the readability of these movments of its leaf shaped hands is the anti-reflective sapphire crystal. It is available in a choice of intense black or luminous white silvered dial. A part of the NeroUno debut watch collection from the Italian manufacturer's of writing instruments, it is powered by a Ronda 6004 quartz movement and is water resistant to 40m. Set in a 42mm stainless steel case, its guillochÃ© patterned black dial is fitted with a small seconds sub dial instead of a sweep hand. The anti-glare coating on the sapphire crystal lends clarity to its elongated nickel hands. Designed to commemorate the International Yachting Regatta, this maritime watch is water resistant to 50 metres and comes in the signature 12-sided red gold case. The charcoal grey dial adorns 12 monochrome nautical pennants along with super luminous hour and minute hands set in red gold. 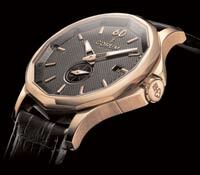 It is finished with a black crocodile leather strap and an 18 carat red gold tongue buckle engraved with the Corum logo. From a brand hailed as the official supplier of chronographs to the aviation world, this watch is a signpost in precision. A contemporary re-interpretation of its 1958 version, it features large baton type straight line hands highlighted by a luminescent substance and finely recessed and snailed hour markers. It is available in two dial variations, mercury silver and black, and flaunts an 18 carat gold rendition of Breitling's 'B'. With a dial that features the interplay of Arabic numerals and pomme hands, this vintage marvel comes in a 42mm wide case set in polished steel or 18 carat rose gold. It touts an automatic chronograph La-Joux-Perret movement with a flyback function and is finished with a black hand-stitched alligator leather strap.